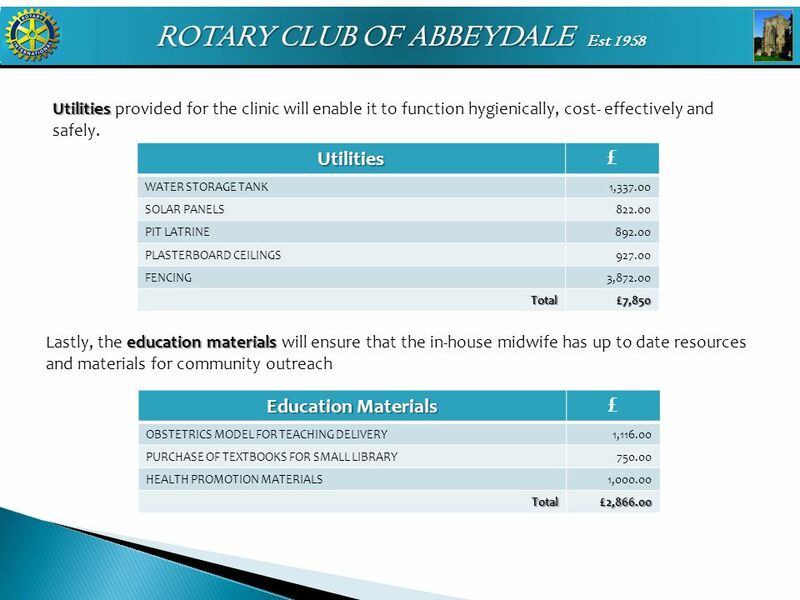 ROTARY CLUB OF ABBEYDALE Est 1958. 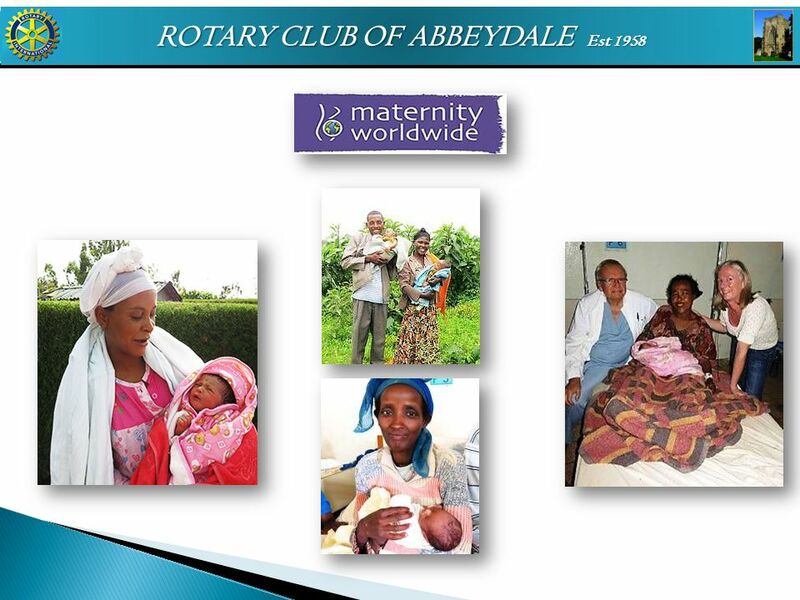 MATERNITY WORLDWIDE This charity was started some 7/8 years ago by senior obstetricians in London supported by trustees. 2 MATERNITY WORLDWIDE This charity was started some 7/8 years ago by senior obstetricians in London supported by trustees from the business world to address these defects in the care of young women.  Teaching and training of village women to act as birth attendants to assist in safe delivery and also to recognise in pregnant women, at an early stage, medical conditions requiring skilled specialist care to allow time for safe transport out of the village to centres of care.  Provide and equip and train Midwives in regional medical centres to offer safe delivery units to provide this care not available in the village.  Facilitate specialist obstetric care in central hospitals by resident obstetricians and visiting obstetricians from developed countries.  Promote, and in a limited way financially support, women in villages to start simple revenue earning businesses to give some security and income to the family unit so dependent on the women. 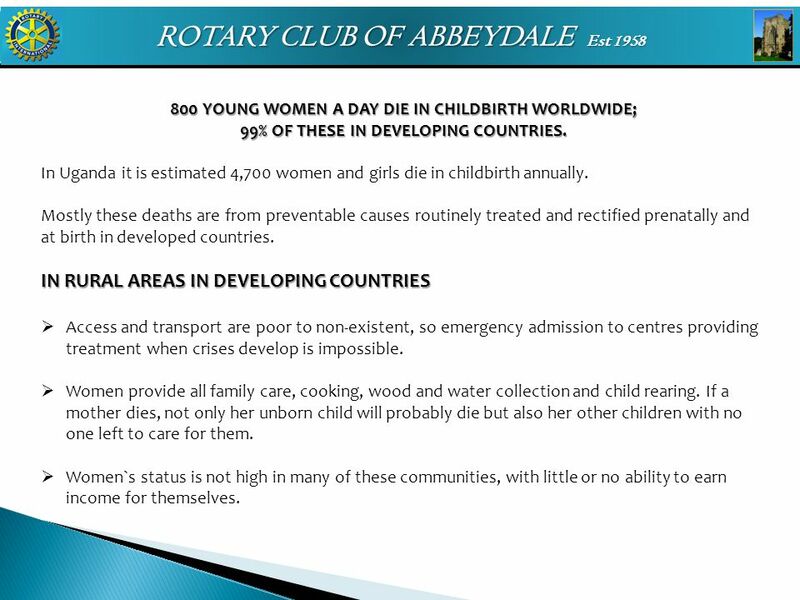 3 ROTARY CLUB OF ABBEYDALE Est 1958 800 YOUNG WOMEN A DAY DIE IN CHILDBIRTH WORLDWIDE; 99% OF THESE IN DEVELOPING COUNTRIES. In Uganda it is estimated 4,700 women and girls die in childbirth annually. Mostly these deaths are from preventable causes routinely treated and rectified prenatally and at birth in developed countries. IN RURAL AREAS IN DEVELOPING COUNTRIES  Access and transport are poor to non-existent, so emergency admission to centres providing treatment when crises develop is impossible.  Women provide all family care, cooking, wood and water collection and child rearing. If a mother dies, not only her unborn child will probably die but also her other children with no one left to care for them.  Women`s status is not high in many of these communities, with little or no ability to earn income for themselves. 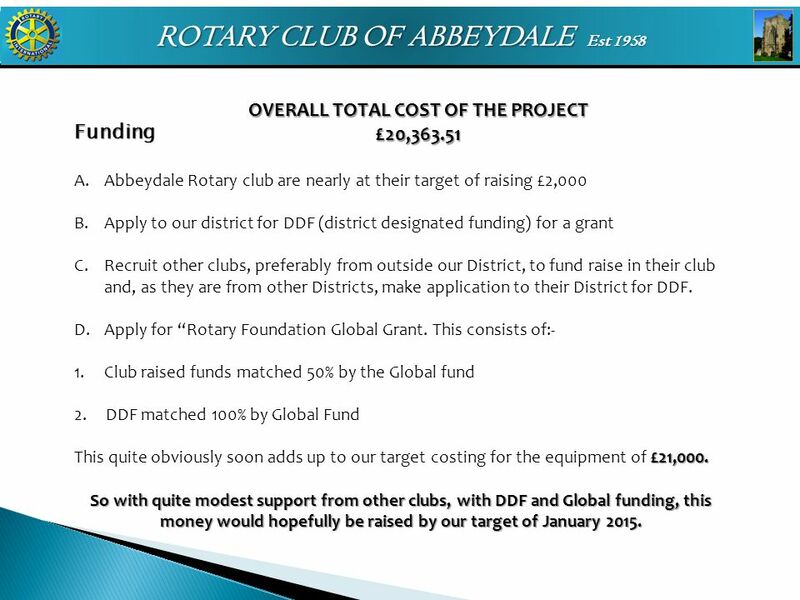 4 ROTARY CLUB OF ABBEYDALE Est 1958 ROTARY SUPPORT Abbeydale Rotary Club has supported financially this charity by a cash contribution. 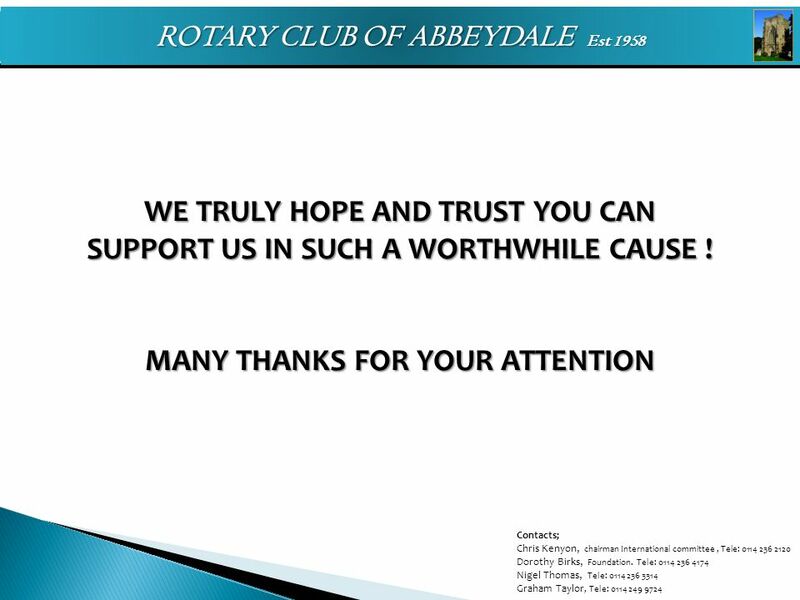 We now wish to support them further by our fund raising activity but crucially this time we wish to access "ROTARY Foundation Global funding". This requires the project to be of a value not less than $30,000 and must be a Rotary project with local Rotary participation in the beneficiary country. 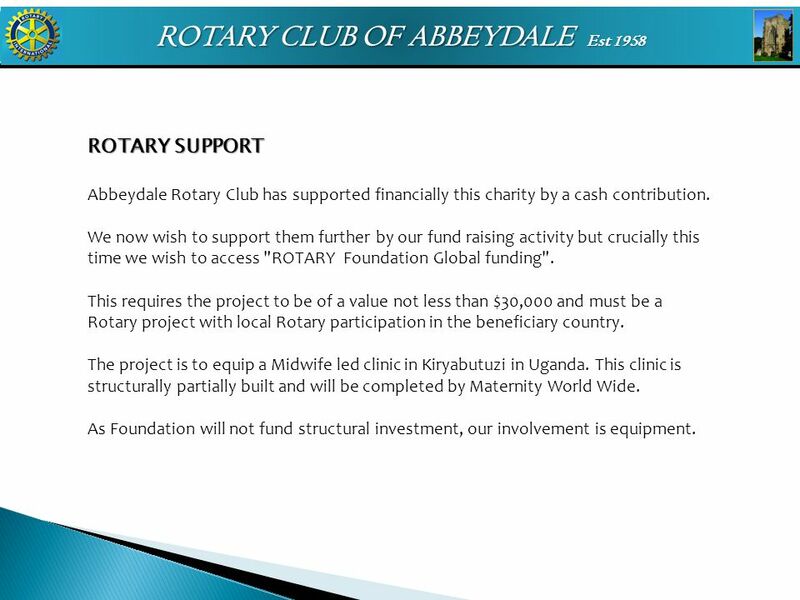 The project is to equip a Midwife led clinic in Kiryabutuzi in Uganda. This clinic is structurally partially built and will be completed by Maternity World Wide. 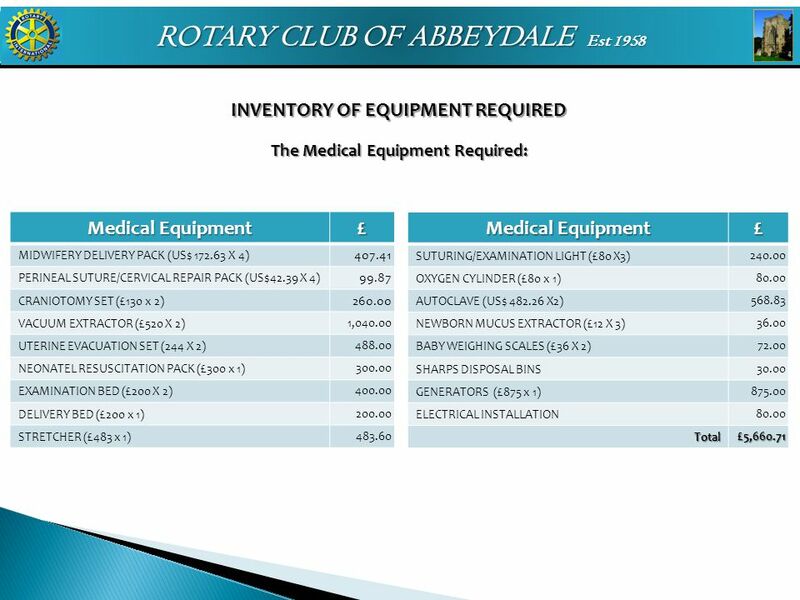 As Foundation will not fund structural investment, our involvement is equipment. 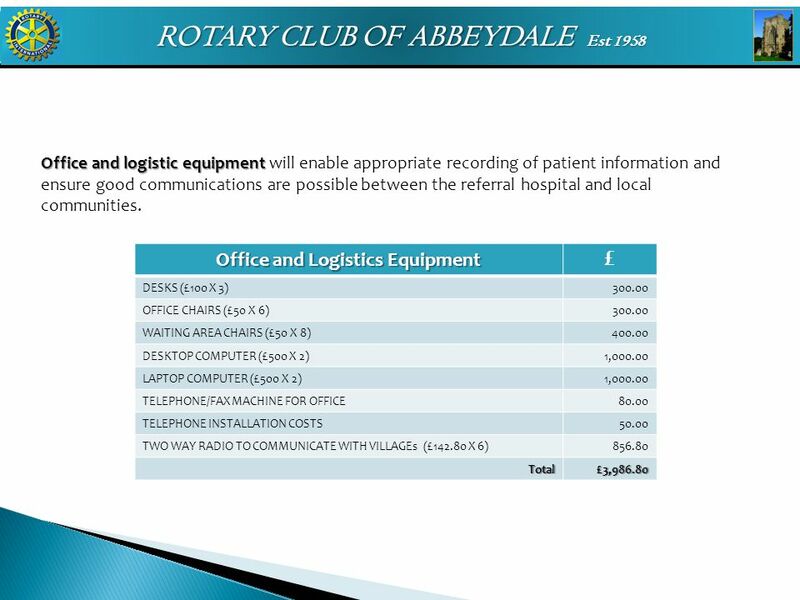 Download ppt "ROTARY CLUB OF ABBEYDALE Est 1958. MATERNITY WORLDWIDE This charity was started some 7/8 years ago by senior obstetricians in London supported by trustees." Presented to FIDE Presidential Board Antalya, 4 February 2011 Ali Nihat YAZICI and Kevin J. O`CONNELL. General Practitioner Training Antenatal Care 26th May 2004 Geraldine Black Community Midwifery Manager. DOING GOOD IN THE WORLD. Doing Good in the World | 2 OUR MISSION World Understanding Goodwill Peace. Grant Management Seminar 1 District 5180 Club Certification & Grant Management Seminar. Ron Kelemen, Chair Stew Martin, ex-ViceChair District 5100 International Service Committee International Service 101 Getting Your Club Started on Rotarys. Saving Mothers Giving Life (SMGL) SMGL-SMS : applying mobile phone-based system to reduce maternal mortality in Kalomo District, Zambia. The Canadian Foundation for Economic Education and The Building Futures Network present. TITLE District 5470 Rotary Foundation Seminar District Grants Chris Unfug May 3, 2014. Grant Management Seminar 1 District 5930 Grant Management Seminar. Saving a Generation: Maternal, Newborn and Child Health (MNCH) Eastern and Southern Africa Aga Khan Health Services.  Created by City Council in October Original purpose of the fund: To support housing opportunities for workforce families. $600,000 fund.  On. LOCAL DIALOGUE IN MIDWIFERY CARE THE FAMILY: OUR PRIORITY. CHFS ANNUAL MEETING April 14, 2014 Baby Basics John Ladd, MNO Cuyahoga County Office of Early Childhood Invest in Children. Rotary District 7690 The Rotary Foundation/Future Vision GLOBAL GRANTS BASICS TRF / FV, Membership, New Generations Seminar.